Over $3 Million has been invested in the Gambar Project which is currently Operational producing Tin, Columbite and Tantalite. Previous mining activities dates back to 1968. 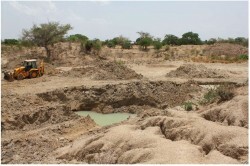 Preliminary Geological evaluation of the Tin –Columbite deposit on Exploration License NO.12408 in January 2013, uncovered Rhodium, Gold and other commercial valuable minerals. The Project Management excavated 20 tons of ore, washed it from clay which yielded 500kg of the pre-concentrated material. This ration indicates that every average ton of ore contains 25kg of pre-concentrated material. The highest concentration of manually washed Ore yielded 6,221%Nb, 3,859%Ta, and 10,110%Sn. Other concentration from sampling programs revealed Rh: 0.010%, Au: 0.001%, Ag: 0.8% and U/TH: 0.01%. All required licenses, permits and registrations are in place to carry out exploration and resource definition drilling. The land making up the Project (“Project Area”) encompasses 26.3sq.km and located 4.6km west of Boi town under Tafawa Balewa LGA. The project area is accessed through a Farm Road from Boi town. By car, it takes about 30 minutes on a distance of 7.3km by road from Boi to Gambar Project. The Gambar Project is bounded by latitude 9°30´30"N and 9°33´45"N and Longitude 9°25´30"E and 9°28´00"E. Under the UTM zone 32 coordinate system, it is bounded by 546640mE and 551221mE, and by 1050986mN and 1056980mN. The area consists of rocks classified as Older Granites with age of 560-550 million years range, and associated wide- spread pegmatites. The Pegmatites are spatially linked with the older granites and are considered Cogenetic with the older Granites. The pegmatites are known to be mineralized with Tourmaline and amethyst deposits. The gneisses, migmatites, mylonites and banded granites occupy the areas in the immediate neighborhood of the shear zones, where the rocks show flow structure, banding and recrystallisation. This shear zone appears to have been formed during the emplacement of the centre1 of the Sera- Fier complex. During the Jurassic (151m.y), there was the emplacement of the Younger Sera- Fier Granites ring complex, which is represented in the area north of the Gambar Village. In the Gambar area, the Younger Granites have been well mapped by MacLeod et al, 1971, around centre1 of the Sera- Fier Complex. The rock types in the locality include aplitic granite, hornblende- biotite-granite, the Sara hornblende- granite and hornblende- granite porphyry. emplacement of basaltic/ dolerite dykes in the Tertiary/ Quaternary period. Field relationship show Older Granites and pegmatite bodies intruded by several veins and basic dykes of the basalt/dolerite composition, which are of the Tertiary/ Quaternary age. There are structural features that mark the geology of the area as observed from field mapping. It appears that the first tectonic activity in the area is the formation of the ring fractures for the emplacement of the Sera- Fier Younger Granites. 10 of the Maijuju priority sheet MJJ-IV (169 S.E). Tin mining boomed in the area leading to the establishment of an aerodrome as at the late 6os. In the course of the survey, one of the beacons was seen showing the boundary between the ML14797, ML3542 and ML4757.